Steam to the Hills on La'al Ratty. 120,000 visitors a year to Eskdale travel in the valley hauled by one of the Railway's delightful narrow gauge locos.The line from Ravenglass on the coast, through hidden Miterdale, to an idyllic terminus at Dalegarth, is 7-miles long. 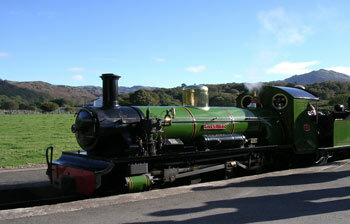 Full-line return tickets are valid to travel as many times as you want on the day of purchase, affording ample opportunity to break a journey at Irton Road, explore Eskdale Green village and rejoin the train at the Green Station.From March to November there are always a minimum of seven trains a day, giving plenty of time to meander to St Catherine's church and the delightful hamlet of Boot. Trains also run most winter weekends, between Christmas and the New Year and at February half-term.